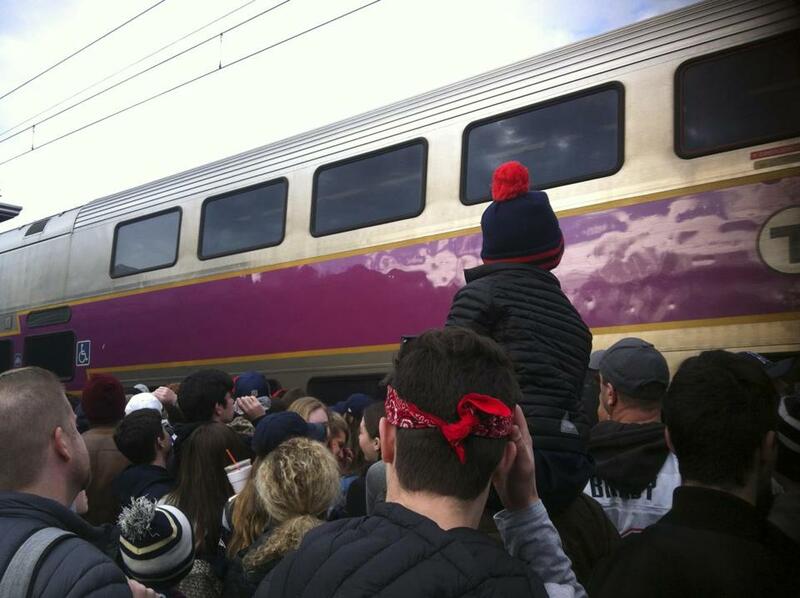 A crowded commuter rail train filled to capacity with Patriots fans did not pick up passengers at the Mansfield station, where hundreds waited on the platform, hoping to get to the Patriots victory parade Feb 5. The rise of shared electric self-driving cars and the transition from a world of ownership to one of consumers purchasing transportation as a service holds the promise of significant economic, environmental, and quality-of-life benefits. But it will also pose an existential threat to public transportation in general and commuter rail in particular. The first recommendation in the December report from Governor Baker’s Commission on the Future of Transportation is “Prioritize investment in public transit as the foundation for a robust, reliable, clean, and efficient transportation system.” In broad terms, the commission is right. But maximizing potential benefits from the unprecedented disruption of surface transportation that lies ahead will also require fundamental change at the MBTA and a hard look at which transit modes are positioned to compete in a brave new world. The commission’s charge was to look at the Commonwealth’s needs and challenges over the next 20 years. But if that horizon is extended to 40 years, station-to-station service to the suburbs is unlikely to be very attractive in a world where shared electric self-driving cars will offer much faster door-to-door service at a price that won’t be much higher. Drivers are normally the largest expense for any transportation business. It currently costs about 55 cents a mile to operate a vehicle with a single occupant. But it’s estimated that the cost could fall to 15 cents a mile for autonomous vehicles carrying two or three passengers, which would significantly reduce public transit’s price advantage. Connected vehicles will also dramatically reduce human error, resulting in big increases in throughput thanks to variables like higher travel speeds, less space between vehicles, and less frequent braking in response to accidents and other travel events. In the future, agencies like the MBTA will probably subsidize trips that are currently taken on commuter rail rather than operate them. Even with the transportation transformation in its infancy, Florida’s Pinellas Suncoast Transit Authority, which serves the St. Petersburg/Clearwater area, eliminated some bus routes further from the urban core, after it experienced an 11 percent overall drop in ridership, and replaced them with subsidies for Uber and Lyft rides. Since then, over 25 US communities have established similar partnerships — and the disruption caused by ride-hailing services is minuscule compared with what is to come. MBTA commuter rail ridership has declined. Nonetheless, it will remain with us for the next couple of decades. It still needs to be improved, but massive investments in new lines like South Coast Rail or, even worse, Springfield, would be a fool’s errand. The biggest challenge for the future will be making transit work in congested downtown areas. One Boston traffic simulation model showed that while shared autonomous vehicles would reduce travel times and the number of vehicles on the road even as total miles traveled rose by 16 percent overall, downtown travel times would be 5.5 percent longer because the vehicles would substitute for transit use. Rising to this challenge will require focusing more investment in the urban core. But success will require something more: changing the MBTA’s top priority from providing jobs and pensions to serving its riders. During a three-year exemption from the Commonwealth’s costly anti-privatization law, the T dramatically improved performance in areas such as cash collection and reconciliation and warehousing and logistics, and saved millions. Despite this success, there was nary a peep about extending the exemption or making it permanent. Few would argue that the MBTA is skilled at putting customers first. The question is whether — in the face of an existential threat to public transit and with far less margin for error — political leaders, bureaucrats, and unions can change the authority’s culture and begin to lay the groundwork that will allow the T to perform the way we’ll desperately need it to in the future. Part of that culture change will be recognizing that commuter rail is poorly positioned to compete over the long-term. When the Patriots win the 2060 Super Bowl, stories about a suburban rail network overwhelmed with riders are likely to generate the same reaction as when we tell our kids about having to get up and walk to the television to change the channel. Hey MBTA, don’t forget Kendall Square! Joseph M. Giglio is a professor of strategic management at Northeastern University’s College of Business Administration. Charles Chieppo is the principal of Chieppo Strategies.